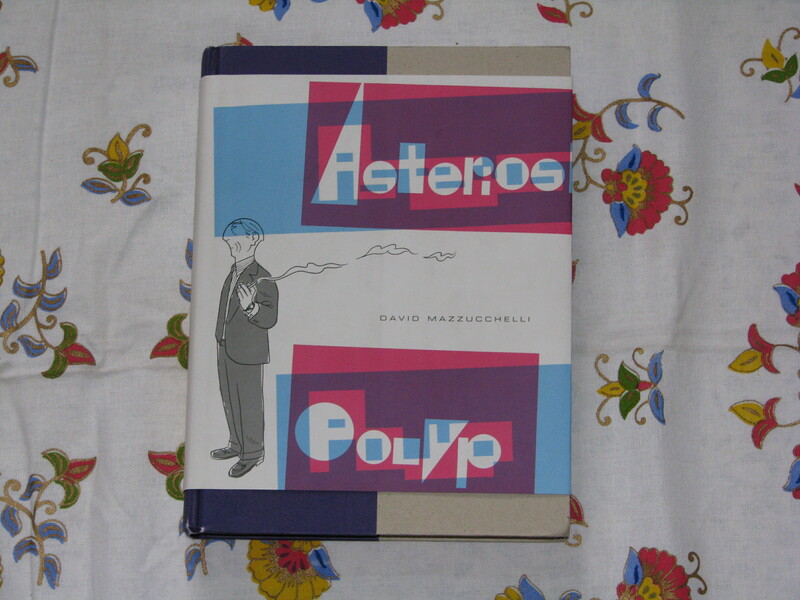 I discovered ‘Asterios Polyp’ by David Mazzucchelli, through a post by fellow book blogger Emily, sometime back (Thanks Emily!). I read excerpts of the book in NYT, and liked it very much. Since then, I have been waiting to get my hand on a copy of the book. Last week, when I went to the bookshop, I discovered it by accident and got it. I finished reading it today. Here is the review. I am giving below a summary of the story from the publisher’s website. ‘Asterios Polyp’ is about an architecture professor and his life and loves. It is also about his philosophy of life and his ideas. The story has two strands – one which describes past events – Asterios’ time as a famous architecture professor, how he meets his wife and what happens after that. The second strand describes the present, where Asterios’ apartment has burned down, and he takes a few possessions and gets into a bus and travels to a distant town, sees an auto mechanic shop and joins there to work as a car mechanic. How things develop in the past and the present and how the two strands come together in the end form the rest of the book. There were many interesting things for me in the story. It took me a while to notice this, but after sometime I did – when each of the characters in the story speaks, the author has lettered the words in a different style and font, unique to each character – I found this quite interesting and innovative, because I haven’t seen this in any other graphic novel. There is a scene in the book, where Asterios reviews the architectural designs that his students have made. After doing that he says this about his students. Asterios : Well, I have two kinds of students. Those who can’t draw, and those who can’t think. And the amount of confidence they have seems to be inversely proportional to their talent. I found it interesting as it made me remember a similar comment made by an art teacher in a book called ‘Berlin : City of Stones’. The art teacher’s comment goes like this. Aristophanes, in Plato’s ‘symposium’, is purported to suggest that human form was not always as it is today. Originally humans were spherical, with four arms, four legs, and two faces on either side of a single head. (In evolutionary terms, it’s hard to see the advantage of this construction). Such was their hubris that they dared to challenge the gods themselves. Zeus, in his wisdom, split the upstarts in two, each half becoming a distinct identity. (Plato makes clear what he thinks of this theory by having Socrates casually dismiss it). Since then, men and women have been running around in a panic, searching for their lost counterparts, in a desire to be whole again. (We should atleast give some credit to Aristophanes for originality). There is a rendition of the story of Orpheus and Eurydice in this book, set in a modern context. What is it about Greek tragedies which makes us sad and cry even after thousands of years? I liked most of the characters in the book – especially Asterios and his wife Hana and his employer and auto mechanic shop owner, Stiff, and Stiff’s wife Ursula. I also liked the way David Mazzucchelli has used simple lines and strokes and a minimalistic style to create this complex story. Most of the illustrations show Asterios in a sideview, which is interesting and open to interpretation. The illustrations are also interesting for the insights that they inspire. 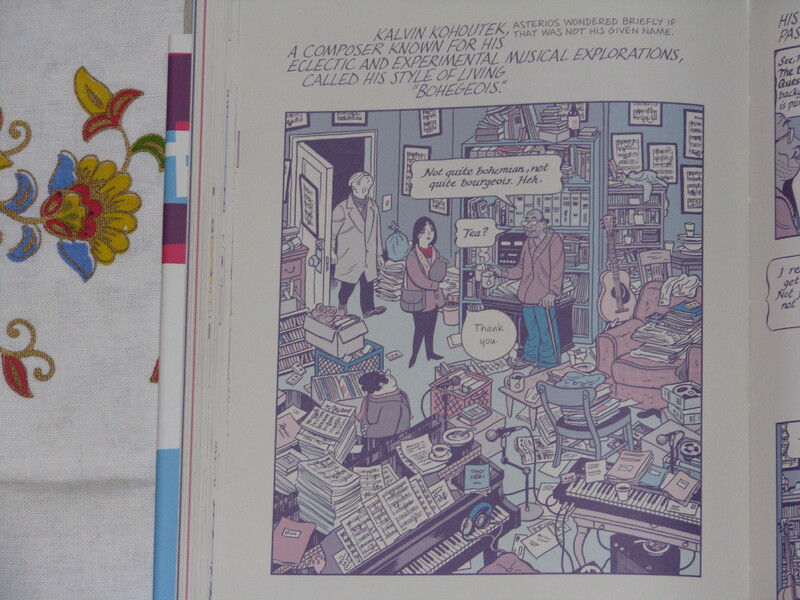 One of my favourite illustrations from the book is that of a musician’s house – you can see it below. I had a friend, who was an amateur artist and booklover, whose room used to be like this (my room is better, but I am halfway there :)) If you are a booklover and spend a lot of time buying books and are struggling to find room for your beloved books in your home – your bookshelves have all been filled to capacity a long time ago and your books have started overflowing onto your tables, chairs, sofa and other furniture and in some situations onto the floor – you will identify with this picture. The book resonated with me at many levels – when it asked questions about whether it was enough for something to be beautiful and be present in the ideal platonic world, or should it manifest itself in the real-world in a complex sub-optimal existence to realize its full meaning? (To put it in the context of the book, was it enough if one developed a wonderful architectural design on paper, or should a building be built out of it, to prove the worth of the design? ), when it tried to look at the contemporary world through Greek literature, when it talked about how memories were as real as reality, when it showed how there is order in chaos in a real artist’s house, when it depicted how love is a beautiful, complex and imperfect thing. The book even makes an environmental point in the end. ‘Asterios Polyp’ is one of the best graphic novels that I have ever read. My most favourite one till now is ‘Berlin : City of Stones’. (You can find my review of it here). I think ‘Asterios Polyp’ is not far behind. You can read the NYT review of the book here and the Comics Journal review of the book here. You can also read excerpts from the book here. ‘Asterios Polyp’ is a wonderful graphic novel – a masterpiece. If you like graphic novels and enjoy complex stories told through this medium, you will like it. Recommended.